Galveston Hurricane of 1900. Image courtesy of National Geographic. Image available on the Internet and included in accordance with Title 17 U.S.C. Section 107. GALVESTON HURRICANE OF 1900. In Galveston on the rain-darkened and gusty morning of Saturday, September 8, 1900, newspaper readers saw, on page three of the local Daily News (see GALVESTON NEWS), an early-morning account of a tropical hurricane prowling the Gulf of Mexico. On the previous day Galveston had been placed under a storm warning by the central office of the Weather Bureau (now the National Weather Service) in Washington, D.C. A one-column headline announced, "Storm in the Gulf." Under that, a small subhead proclaimed, "Great Damage Reported on Mississippi and Louisiana Coasts-Wires Down-Details Meagre." The story, only one paragraph long, had been sent out of New Orleans at 12:45 A.M. that same day, but it added nothing to the information presented in the headlines. Additional details were unavailable "owing to the prostration of the wires." Beneath the New Orleans report appeared a brief local story: "At midnight the moon was shining brightly and the sky was not as threatening as earlier in the night. The weather bureau had no late advice as to the storm's movements and it may be that the tropical disturbance has changed its course or spent its force before reaching Texas." Path of the Galveston Hurricane of 1900. Image available on the Internet and included in accordance with Title 17 U.S.C. Section 107. This hurricane had been first observed on August 30 in the vicinity of 15° north latitude and 63° west longitude, about 125 miles northwest of Martinique, proceeding westward. Galvestonians had been aware of the storm since September 4, when it was reported moving northward over Cuba. From the first, however, details had been sketchy because of poor communications. Ships at sea, where oncoming hurricanes built strength, had no way of telegraphing weather observations ashore, and other nineteenth-century technical shortcomings interfered. Except for the rain and wind, Saturday began in the city of 38,000 inhabitants much the same as any other weekday. People prepared for another stint in the routine of six-day workweeks then common; not even an encroaching tide disturbed them greatly. Galvestonians had become used to occasional "overflows," when high water swept beachfronts. Houses and stores were elevated as a safeguard. A newspaper article on the Galveston Hurricane. Image courtesy of the University of North Texas. Image available on the Internet and included in accordance with Title 17 U.S.C. Section 107. The tide kept crashing farther inland, and the wind steadily increased. The Weather Bureau official in charge locally, Isaac M. Cline, drove a horse-drawn cart around low areas warning people to leave. Comparatively few people had evacuated the city, however, before bridges from Galveston Island to the mainland fell, and many people along the beach waited until too late to seek shelter in large buildings in a safer area downtown, away from the Gulf. Houses near the beach began falling first. The storm lifted debris from one row of buildings and hurled it against the next row until eventually two-thirds of the city, then the fourth largest in Texas, had been destroyed. People striving to make their way through wind and water to refuge were struck by hurtling bricks and lumber and sometimes decapitated by flying slate from roofs. The greatest wind velocity registered before the anemometer blew away at 5:15 P.M. was an average of eighty-four miles an hour for a five-minute period, but gusts of 100 miles an hour had been recorded, and weathermen's estimates later reached more than 120 miles an hour. About 6:30 P.M. a storm wave, sweeping ashore in advance of the hurricane's vortex, caused a sudden rise of four feet in water depth, and shortly afterward the entire city was underwater to a maximum depth of fifteen feet. This storm wave caused much of the damage. The lowest barometer reading was 28.44, recorded shortly after 7:00 P.M. Around 10:00 P.M. the tide began to fall slowly, and little damage occurred after that. A house in Galveston blown sideways by the wind in the hurricane. Image available on the Internet and included in accordance with Title 17 U.S.C. Section 107. September 9 dawned on desolation. Most of the city lay in shambles. Between 6,000 and 8,000 people in the city of Galveston had died, and estimated casualties for the entire island ranged from 10,000 to 12,000. Property damage is impossible to estimate by current standards, but contemporary figures ranged from twenty to thirty million dollars. A high-water mark of 15.7 feet and high winds had destroyed a third of the city, including 2,636 houses and 300 feet or 1,500 acres of shoreline. The sixteen ships anchored in the harbor at the time of the storm also suffered extensive damage. More violent and costlier hurricanes have struck coastal areas of the United States since 1900, but because of the death toll the Galveston storm that year was in the 1980s still called the worst recorded natural disaster ever to strike the North American continent. Construction to raise the seawall after the hurricane. Image available on the Internet and included in accordance with Title 17 U.S.C. Section 107. The raising of buildings in Galveston after the hurricane. Image available on the Internet and included in accordance with Title 17 U.S.C. Section 107. Out of the chaos, citizens developed the commission form of city government now used by many other municipalities. Construction began on a six-mile-long seawall standing seventeen feet above mean low tide, and that protective barrier has been extended since then. 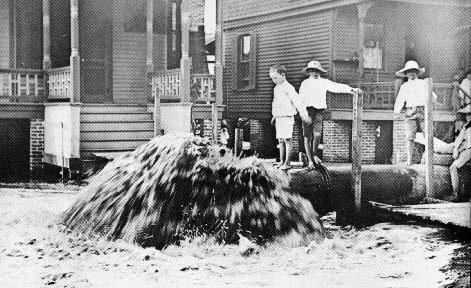 Inside the city, sand pumped from the Gulf floor raised the grade as much as seventeen feet. This work required advance raising of 2,146 buildings and many streetcar tracks, fireplugs, and water pipes. Trees, shrubs, and flowers had to be removed if the owners wanted to save them. The largest building raised was a 3,000-ton church. It was boosted five feet off the ground with jacks, then fill was pumped underneath; church services were held on schedule. The great storm that wrought all this left a long track. From Texas it traveled into Oklahoma and Kansas, turned northeastward and crossed over the Great Lakes and part of Canada, and on September 12 passed north of Halifax and disappeared into the North Atlantic. Galveston Daily News, September 8, 1900. Clarence Ousley, ed., Galveston in 1900 (Atlanta, Georgia: Chase, 1900). John Edward Weems, A Weekend in September (New York: Holt, 1957; rpt., College Station: Texas A&M University Press, 1980). Handbook of Texas Online, John Edward Weems, "GALVESTON HURRICANE OF 1900," accessed April 23, 2019, http://www.tshaonline.org/handbook/online/articles/ydg02. Uploaded on June 15, 2010. Modified on March 21, 2016. Published by the Texas State Historical Association.